It occurred to me recently that Disney animated movies are entering a second period of decline. The first Golden Age lasted roughly 20 years from 1937 to 1959, and encompassed classics such as Snow White, Pinocchio, Bambi, Cinderella and Sleeping Beauty. After a lean period through the sixties, seventies and early eighties, the second Golden Age (Silver Age?) began with The Little Mermaid in 1989, and continued on through Beauty and the Beast, Aladdin, The Lion King, Pocahontas and The Hunchback of Notre Dame – and it is probably no coincidence that this was also the time when Alan Menken was the King of the Mouse House’s musical department. Recently, though, their output has been lackluster at best; it’s highly unlikely that The Emperor’s New Groove or Chicken Little will be mentioned in the same breath as their esteemed predecessors. Again, and ignoring the horrible misfire that was Home on the Range, it’s also likely to be no coincidence that Alan Menken has largely been absent from their most recent efforts. 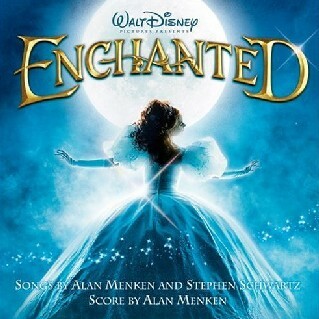 As is usually the case, Menken’s contribution to the film comprises both songs and score – although, on this occasion, the songs have a street-smart twist which characterizes the film’s unusual setting. The opening ditty, “True Love’s Kiss”, is a sweeping prototypical Disney affair performed by Adams and Marsden which sees Giselle and Edward and lavishly singing of their love for each other, and the inherent romance of relationships in Disneyland. “Happy Working Song”, however, is a sly send-up of ‘Whistle While You Work’, in which Giselle gaily goes about her daily chores, cleaning crud up in the kitchen, removing hairballs from the shower, and emptying vacuums, with the help of various urban critters. “That’s How You Know” is an upbeat song unexpectedly inflected with Caribbean and reggae rhythms, steel drums and a vibrant chorus, bringing back memories of ‘Under the Sea’ and The Little Mermaid. The two commercial efforts are by Jon McLaughlin and Carrie Underwood respectively; Underwood’s powerful performance on “Ever Ever After” is likely to be the film’s most recognizable musical element, and will undoubtedly result in Menken’s sixteenth Oscar nomination. The score, like the songs, are very much rooted in the grandest Disney tradition, but also contains the same sense of it being a bit of a nod-and-a-wink, paying homage but gently teasing the great music that preceded it. I’ve always felt that Menken’s score-writing was somewhat overlooked in favor of his songs, and have often wanted him to take on more assignments where he was purely providing dramatic underscore (as he did on The Shaggy Dog last year); once again, and to further prove my point, he shows his talent in this arena with a delightful score that is full of energy and whimsy. The themes from the songs appear in instrumental form in a large part of the underscore, with the True Love Kiss theme forming the core of the opening “Andalasia”. The generally quite dark “Into the Well” contains an unexpected allusion to Ennio Morricone’s score for The Mission of all things, before descending into a period of bold choral writing and chaotic piano chords to underscore the terrible banishment Giselle endures. Once the action moves to New York, the score takes on a new aspect, which is alternately vibrant and energetic, as heard in the defiantly modern, chick-flick-inspired version of the True Love Kiss theme in “Girls Go Shopping”, but tempered with a slightly less sentimental, more bittersweet romantic tone, as heard in the lovely “Robert Says Goodbye”. One cue of magnificently rampant action music – “Narissa Arrives” – threatens to spoil things for Giselle with portentous Latin chanting and fantastic swirling brasses that scream out ‘Disney Villain’. The score’s 10-minute set piece, “Storybook Ending”, begins with a subtle battle between Narissa’s theme on low woodwinds and the True Love Kiss theme in the string section, and gradually builds into a wonderfully exciting collision of two styles in an action setting, reminiscent of the way George Bruns had Aurora and Maleficent’s dragon facing off at the end of Sleeping Beauty back in 1959. At the height of the conflict, Menken even throws in some harrowing brass trills, as though he think’s he’s Elliot Goldenthal! Everything works out in the end of course, as these things always do, and the score concludes with a sparkling rendition of the main theme for the massed ranks of the orchestra in the sweeping “Enchanted Suite”. Even in Disney movies like these, everyone lives happily ever after, and James Marsden gets to sing Dean Martin songs. Whether Enchanted will reaffirm the dominance of the Disney animated feature at the box office – it’s not a traditional animated film in the strictest sense, having more in common with Roger Rabbit than Bambi – remains to be seen, but one that’s clear is that Alan Menken is back to the top of his game. The Shaggy Dog notwithstanding, it’s been a long decade since he was last at the forefront of things, and I for one welcome him back into the fold with open arms. Music composed by Alan Menken. Conducted by Michael Kosarin. Orchestrations by Danny Troob, Blake Neely and Kevin Kliesch. Recorded and mixed by John Richards. Edited by Kenneth Karman. Album produced by Chris Montan, Alan Menken and Stephen Schwartz.